All our concerts start at 7.30pm and take place in St James's Parish Church, Church Street, Wetherby (by kind permission of the Priest-in-charge). 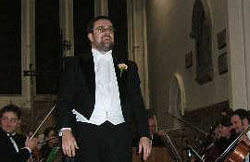 They will be conducted by John Dunford with Wetherby Pro Musica Orchestra. First World War in November 1918. An essential part of the seasonal festivities. uses orchestra, four-part choir and six soloists. Joseph Haydn’s devout, celebratory Age-of-Enlightenment oratorio. Wetherby concert tickets for our 2018/19 season are £16 each (£17 for Messiah at Christmas), but free to those aged under 18. Tickets can be obtained from the Ticket Manager by telephone: 07860 454894, or by email. They can also be obtained from Nicolla Florist, 1 Bank Street, Wetherby, LS22 6NQ, telephone: 01937 585233. Other ticket sources are Choral Society members, and usually at the church on the evening of the concert - unless they have sold out beforehand, of course.